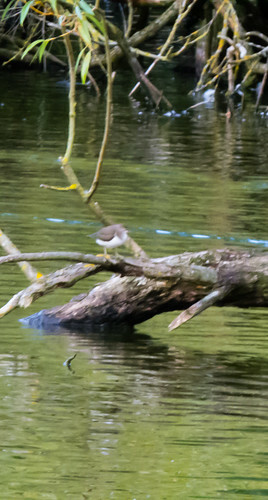 Seen about an hour ago: common sandpiper on the lake at West Park. First spotted flying across the arm of the lake nearest the city centre. Landed on a fallen, bare tree by the island on that side of the lake. It seemed totally unconcerned by the other, larger, birds nearby. Turned around several times, stretching its wing. Then, after a few minutes, flew away under the bridge.